The Burmese government has locked down troubled Rakhine state, blocking independent access to media and aid organizations. But there is another, albeit less precise, way to assess the ground reality for Rohingya in Burma: calling them on their cellphones. Testimony gathered last week from more than a dozen such conversations suggests that Burma’s leaders are either misinformed about events in Rakhine or intentionally misrepresenting them. Since Rohingya militants attacked Burmese police posts on Aug. 25, the Burmese military has swept through northern Rakhine in “cleansing operations” they say are aimed at eliminating terrorists. The United Nations has called it a “textbook example of ethnic cleansing.” Rohingya have fled that scorched-earth campaign at a rate not seen since the Rwandan genocide in 1994, although the flow has slowed over the past two weeks. 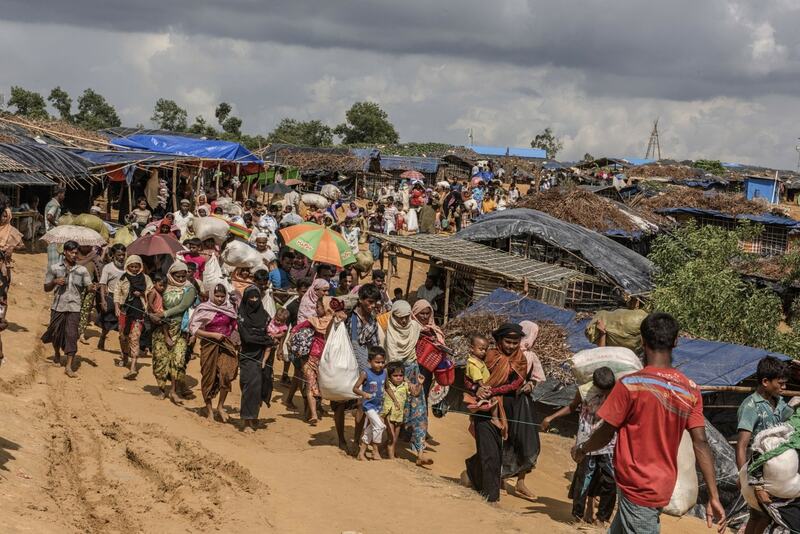 Now more Rohingya live in severely overburdened camps in Bangladesh than they do in Burma. The people contacted by or in the presence of a Washington Post reporter were at various stages of peril. Some were in a Rohingya village under siege, where anyone who tries to sneak out is reportedly gunned down. People there are beginning to starve. 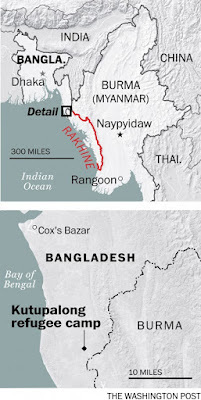 Others were among thousands stranded on a beach in the village of Alel Than Kyaw, corralled by the Burmese military while waiting for boats to take them to Bangladesh. The Washington Post cannot independently verify these claims because of the lockdown in Rakhine state. But the accounts, which are in line with interviews done by human rights organizations as well as satellite imagery, indicate that the Rohingya exodus is far from over. Only three tiny spots in this sprawling expanse of tents offer access to a few bars of Burmese cell service. Rohingya refugees who’ve been at the camps for decades — since earlier waves of violence — have shown the new arrivals exactly where to stand to make calls. Streams of people gather there, clutching scratched-up phones, sometimes laughing, often crying. The calls are laden with anxiety. Each holds the possibility of heartbreak. When a call to Shazia Alam finally went through on Thursday, the sound of babies wailing reverberated as she said hello through speakerphone. She was with about 400 people from her village, on a steep hillside near the Burmese coast, with a rain-swollen river in the valley below. The chance of catching a boat from Alel Than Kyaw to Bangladesh was just a half-day’s walk ahead, but they’d heard the military was there. After all they’d seen, they were avoiding uniformed men at all costs. Their village in Rathedaung township, Tar Zaw, was torched three weeks ago she said, and its residents had sought shelter in other Rohingya villages not yet “visited” by the military. But the soldiers and their accompanying mobs of local Buddhists were never far behind. Last Tuesday, in their third village, elders made the decision to leave Burma for good. They’d all been walking since then. And now they were stuck. Her 19-year-old son, Sayid, listened helplessly to her voice. He fled to Bangladesh three years ago after being beaten by Burmese military officers. He’d missed his mother before, too, but said the past two weeks had been excruciating as he has struggled to find the means to call her as often as possible. Spending the dollar it costs to buy the smallest package of minutes for his cellphone might mean skipping meals. Although the flow of Rohingya started to slow about two weeks ago, recent satellite imagery shows a mass of people camping at Alel Than Kyaw, probably numbering in the thousands. Most are from Buthidaung and Rathedaung townships. The first month’s influx came mostly from Maungdaw township, where Reuters reporters found all but one Rohingya village reduced to smoldering ash in early September. On Thursday night, more than 60 drowned when an overloaded boat from Alel Than Kyaw capsized just minutes from reaching the Bangladeshi coast. Most of the dead were women and children. That the Burmese military is trying to turn back Bangladesh-bound Rohingya is a new dynamic. Since the exodus began on Aug. 25, Burma’s goal had appeared to be the expulsion of the Rohingya, whom it considers illegal interlopers from Bangladesh. Both Matt Wells, senior crisis adviser at Amnesty International, and Chris Lewa, director of the Arakan Project, said they had heard reports of Rohingya being forcibly prevented from fleeing. Burmese state media has touted the decision, saying authorities have promised to provide food and transportation to villages. Whether Rohingya would be safe doing so, and whether their villages even exist anymore, are big unknowns. Cooped up in the Burmese township of Buthidaung, a Rohingya religious scholar scoffed at the idea that the government had suddenly become compassionate. Rather, he said, it has realized that Rohingya refugees in Bangladesh are exposing atrocities in Rakhine and tarnishing Burma’s image. He spoke on the condition of anonymity because he interacts with Burmese military officers regularly and did not want to jeopardize his safety. As dire as others’ circumstances were, they seemed enviable to Mohammad Arif, speaking by phone from the Rohingya village of Sin Gyi Pyin, in central Rakhine’s Minbya township, far from the epicenter of the crisis in the north. Lewa, of the Arakan Project, said that the situation in central Rakhine had been tense since August, too, and that outside organizations had little to no access. The Post spoke with two others from Sin Gyi Pyin who repeated Arif’s claims. The line went near-silent for almost a minute as Arif wept. Joe Freeman in Rangoon contributed to this report.